So, after a week in Prague, Czech Republic, and another week in Kraków, Poland, its official. When it comes to media use, especially cell phones, there are no differences between us and them. I started traveling in Eastern Europe about 20 years ago. With no claim to be especially scientific, here are some observations…. First, no one uses cameras anymore. Everyone has a cell phone and is attempting to capture the perfect travel moment. In two weeks I took an enormous number of pictures because I could. I recall trips in the past where I worried about the battery of my camera running out, or my film being overexposed in TSA X-ray machines. To this day I have boxes full of developed pictures that should never have been printed because they were blurry or dark. 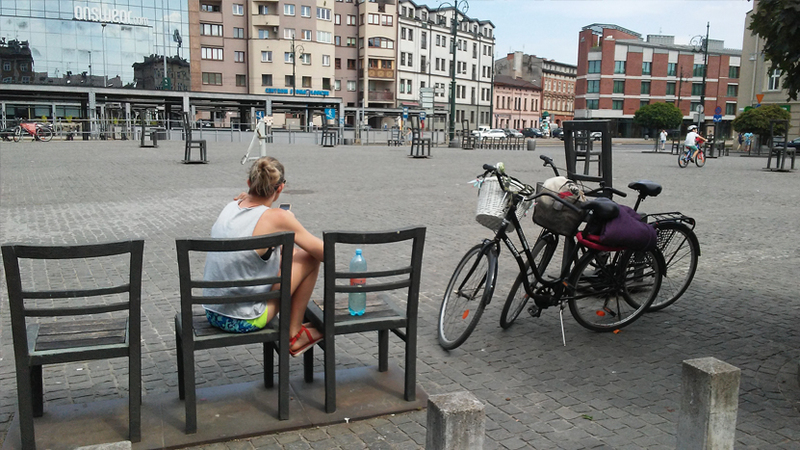 In our little group of four travelers, we had four phones. I am pretty sure that when we pool our pictures, there is nothing that we missed. I took the above picture of people taking pictures. 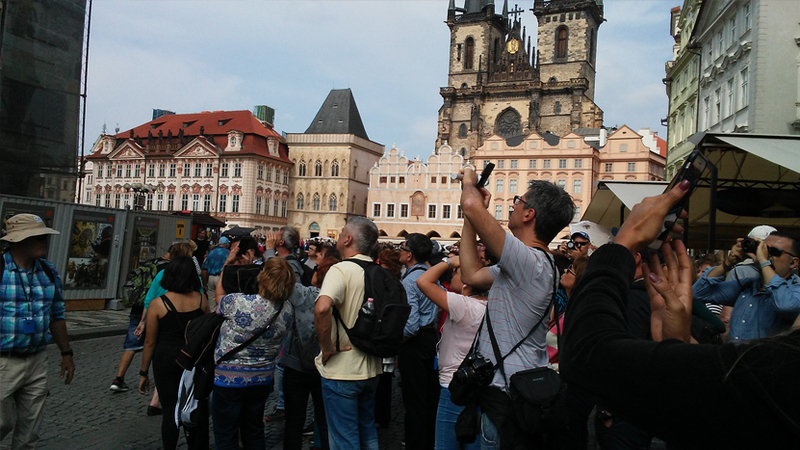 In the Old Town Square of Prague, there is a very famous astronomical clock that is a must for tourists. Currently it is covered with scaffolding for restoration. So, tourists are taking pictures of a picture of the clock painted on the scaffolding! When they get home and see that photo, the delete button can be their friend. Second, cell phones can just look out of place. Or as they say on ‘Sesame Street’, one of these is not like the others. 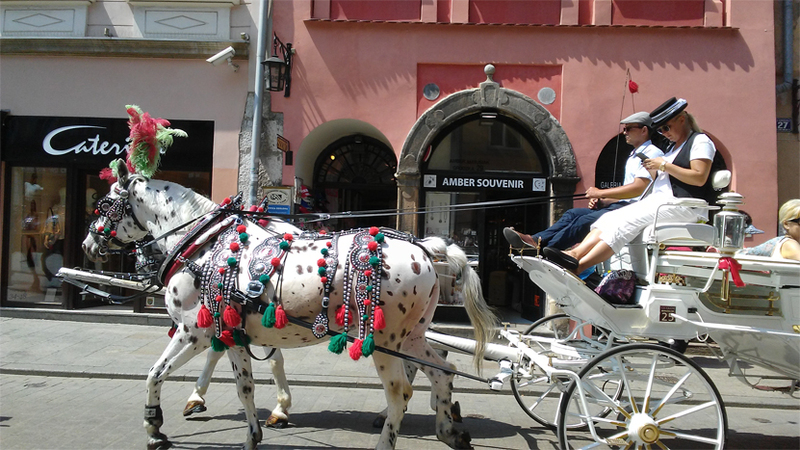 A charming, romantic carriage ride, with horses beautifully decorated….drivers in appropriate 18th century garb….the cell phone just seems wrong. Where is the historical accuracy? And what is so important, either for the driver or passenger, that they just can’t enjoy the beauty of an old city like Kraków for 5 minutes! When we first began traveling in Eastern Europe, cell phones were very expensive but highly sought after because so many old 17th century buildings were structurally impossible to install land lines for phones. Outside phones booths were neighborhood standards for everyday communication. Now, old and young are constantly connected, just like we are because of the cell phone. I like to think that is a good thing.